I hope you are enjoying your weekend so far. Do you wonder, like I do, when we might actually get seasonal weather? We are doing the Thai Black Sticky Rice right now, and if I can convince my cooking cohorts, we’ll be switching that up soon too, just for a change:) The sticky rice is super yummy, but we’ll come up with another delicious option; right now I’m thinking chai millet with blueberries and apples and hemp seed whipped cream, but we shall see what the week brings…I’ll let you know. For soup, we have a delicious Cream of Broccoli, which is vegan of course. The secret ingredient is a rich cannellini bean cream. We’ve got other veggies in there too, so it has a slightly orangey hue, kind of looks like broccoli cheese soup, if you’re into that sort of thing…the bowl is served with Millet Bread and 5-Spice Carrot-Almond Pate, and you can get that as a side too. That’s all for now, for more inspiration, come on into the cafe! The final class of the Basics series is tomorrow (Sunday) at 4:30pm. We’ve still got a spot or 2, if you’d like to drop in. Because we are expanding the cafe hours to serve dinner very soon, future cooking classes will be available and will be taught in a similar format, but in a home kitchen. I can accommodate small classes in my little galley kitchen and, in fact, like to teach there because it’s proof that you don’t need a big, fancy kitchen in order to cook delicious, healthy food for your family. I’m also open to teaching at someone else’s home if there is a volunteer host. It’s always fun to put a class together with friends…And, I love to do one-on-one or small group consultations and Pantry Overhauls! In light of all of that and a few other things, the Baking Class that was proposed for next Sunday is being tabled. I know we had a good class-full interested, so I am open to coming up with a way to teach at another time and space, most likely during the school day, though I know that’s tricky for many. I hope you enjoy the rest of your weekend in peace and good health. Time to take care of ourselves with all of these weather changes – keep the cold from catching you with our Spicy Split Pea and Vegetable Puree. It’s a beautiful golden soup; while I’m not a vegetable-hider, you’d never know that this soup is filled with all kinds of veggie goodness…in addition to the usual vitamins and minerals, it’s all got lots of immune-builders like onions, garlic, ginger, and some pureed chili flakes for a bit of a kick! 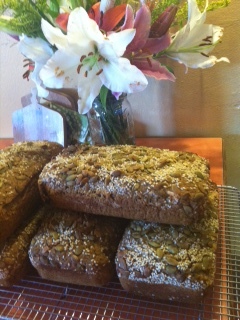 Pick up some of the Sprouted Grain Multiseed Sourdough bread you see on the upper right and you have a perfect Fall meal! We’ve used the last of our tomatillos for our Black Bean Burger with caramelized onions, local tomato, lettuce, and tomatillo salsa on a sprouted sourdough bun. If you are in the mood for a sweet meal, our current porridge inspiration is Kheer, creamy brown rice spiced with a bit of ginger and topped with berry sauce and coconut. Our Sprouted Grain Waffle Special is drenched in berry sauce and coconut cream sauce. 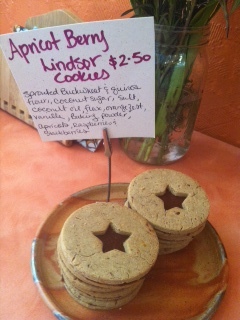 We’ve also got a sweet Raspberry, Apple, and Plum Pie and Apricot-Berry Linzer Torte Cookies, which you can see above. Our cooking class series is full, but if you are still interested in one or all of the classes, please let us know and we’ll see if we have enough for a second round. We’ll hope to continue with a baking class before the holiday baking begins, in later November or early December. Perhaps in January, we’ll focus on soups? We’ll keep you posted here! We will be open this weekend, but closed on Monday for Labor Day. We will NOT be at the Market this Saturday, so please swing on by Julia’s Kitchen for anything you need! 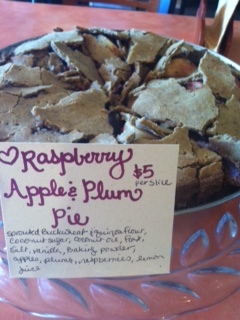 If you are in town this weekend, please stop in for breakfast, lunch, or a yummy treat! Have a wonderful weekend!